Many bloggers go through a period of slowness from June to August, known as the infamous “summer slump.” Traffic and readers may be down during this time, but that doesn’t mean you should just give up on your blog. This post contains affiliate links. Instead, it’s a perfect time for some house (blog) cleaning! The following 10 blogging tasks are great to fill your time during the slowness of summer. If you link to other bloggers often, you are bound to have some broken links on your site. Blogs die, other bloggers rebrand or move to a new domain; permalinks may be changed without redirects. No matter the reason, it’s a good idea to clean these up for your readers and for SEO. Revive that old content sitting on your blog with a new image designed just for Pinterest. Also, the summer is the perfect time to read through older posts and remove any outdated info or links. You can also add new, updated info if you have it, do new keyword research for SEO, and add affiliate links. It’s easy to keep adding to the sidebar without taking the time to remove anything. Check contracts for any ads you are running, and remove any that have expired. Change up (or add) new popular posts to your sidebar for new readers to see. Consider moving sections around for a fresh look for older visitors. It is easy to neglect your “About Me” page when it’s busy, but it is one of the most important pages on your blog. It’s typically the first one PR reps look at when they are considering working with you. Add a recent photo of you, your children, or your family. Update links to more recent sponsored campaigns you have done. 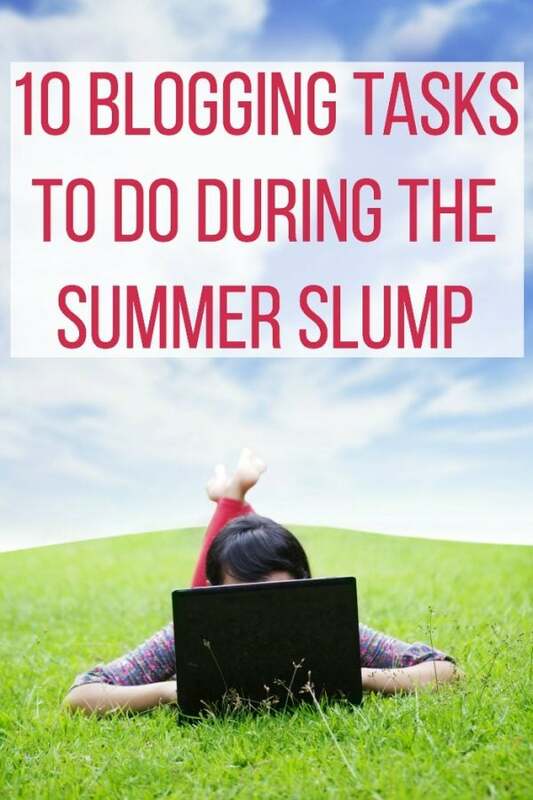 The summer slump may have you not wanting to post much, but you can still be writing. You will likely be busy from September through the end of the year, so take advantage of the slow time to schedule evergreen content during the busier season. Make sure your bios on Facebook, Twitter, and other social networks are up to date. Update your children’s ages, new topics you are discussing, or other hashtags and info pertinent to your blog. Take a look at your Pinterest boards and consider consolidating or creating new ones to organize. Now that you have the time create specifically sized images to share your more popular posts on Facebook and Twitter. This makes them more clickable since your followers aren’t getting an awkward, cut-off image that was created for Pinterest. Buffer has a great article on the recommended image sizes for various social media networks. Bloggers always appreciate comments, and some will return the favor…making your blog appear less deserted during the summer. Read your favorite blogs out there and be sure to leave a thoughtful comment sharing your opinion. Since you have time, follow links in the comments to discover new blogs you may enjoy reading. Most bloggers will attest to being in too many Facebook groups. With so many new ones being created every day, for a variety of blogging related topics and tasks, it is easy to find yourself in 100+ groups at any given time. Go through your list of groups, leaving ones you haven’t visited in the last 1-2 months. Add your most visited groups to the Favorites list on the left side of your Facebook feed, so you can quickly access them when needed. 10. Redesign your blog – or hire someone for a new look. If you aren’t getting much traffic, the summer is a great time to do a little design fiddling. Change your header or tweak a new theme for your blog. If you aren’t design savvy, brainstorm the new look you desire and contact a designer for their services. Do you have any blogging tasks to add?